CSUB assistant professor of economics Richard Gearhart speaks at the 2018 Kern County Economic Summit at the DoubleTree by Hilton in Bakersfield. The Kern County Economic Summit is a clear depiction of what markets our county is capable of tapping into, bringing economic and scholastic movers and shakers near and far to brainstorm what economic trends will shine through this year. The 19th annual summit, a partnership between the Kern Economic Development Corporation, CSUB and the Greater Bakersfield Chamber of Commerce, provides valuable information designed to educate and broaden perspectives on local, national and international economies and takes place March 13 from 7 to 11:30 a.m. at the Bakersfield Marriott at the Convention Center, 801 Truxtun Ave. 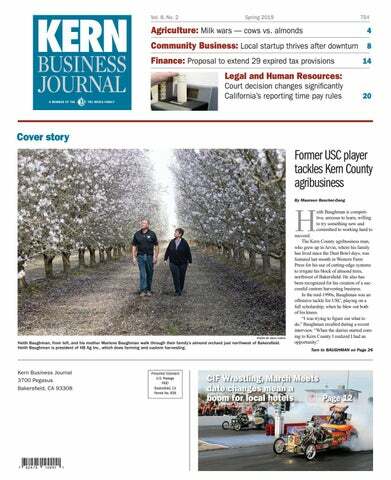 According to KEDC President and CEO Richard Chapman, Kern County often gets the reputation for being an oil and agricultural city but the county has the potential to tap into other industries and markets, also. In the past year alone, Amazon, Walmart and L’Oreal have made efforts to establish a presence in Kern County, taking advantage of its central location to many major destinations in California. That’s in addition to Kern retaining its No. 1 spot as the top-grossing farming county — a title it claimed for the first time ever in 2017 — and the county’s consistent reputation as a popular landing spot for millennials. Diversity in age makes Kern County capable of tapping into different markets, just as much as its environment and its varied industries. Addressing a variety of topics are Economic Summit regulars Richard Gearhart and Nyakundi Michieka, assistant professors of economics at CSUB; a panel on “Fostering a Strong Entrepreneurial Culture in Kern County”; an update on Kern County real estate by Jordan Levine, senior economist with California Association of Realtors; and keynote speaker Dan Walters. Walters has been a journalist for nearly 60 years, writing the state’s only daily newspaper column devoted to California political, economic and social events in 1981. In 2017, the column shifted to CALmatters.org, a nonprofit devoted to California public policy issues. Walters frequently appears on CNN, Fox and other networks to talk about political developments in the state. The collection of experts — both local and from outside the area — will provide more in-depth analysis regarding what markets Kern County is well-positioned for in the upcoming year. Individual tickets are $100. For ticket purchases and more information, go to www.kedc.com/events/economic-summit.